Computer networks began long before PCs, going back to the 1960s when mainframes were common and minicomputers were first introduced. The goal of networking was, of course, sharing data among users. Then as now, networking requires each user to have a unique "address," a protocol for data to be formatted to make sharing easy and a means of transferring data. Sharing data between computers and users over cables originally required high speed cables, usually coax but also shielded twisted pair. For many years, networks were mostly proprietary, that is they worked only among computers made by one company such as IBM, Wang or DEC (Digital Equipment Corp.). In the 1970s, multiplatform networks like ARCnet and Ethernet were developed to allow different computer types to network and in the 1980s, networking took off with the introduction of the inexpensive PC. The first networks like Ethernet, Arcnet, WangNet and DecNet used coax cable for as a transmission medium because it offered the highest bandwidth. Coax was used as a data bus, with network attachments connected along the cable. Thus every network device received all data transmitted but ignored any that were not addressed to it. Other networks, primarily IBM's Token Ring, used shielded twisted pair cable connected into a ring. In a ring, every network attachment is a repeater, receiving data from the network, filtering out messages for itself and passing others along. The same architecture was adopted for Fiber Distributed Data Interface (FDDI) which was the first all fiber high speed network. FDDI, shown here, used a dual ring architecture to allow the network to survive failure of either a cable segment or a network station. 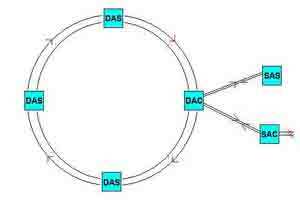 Sone FDDI stations connected to the counter-rotating ring backbone (dual-attached stations (DAS) or dual-attached concentrators (DAC) which could also connect single-attached stations (SAS) onto one ring. UTP (unshielded twisted pair) cabling became a standard primarily to support the two most popular computer networks, Ethernet and IBM Token Ring. Although Ethernet was originally developed as a "bus" network using taps on coax cable and Token Ring used a "ring" architecture on shielded twisted pair cables, both were easily adapted to UTP cabling. The development of balanced transmission techniques for UTP cable provided a lower cost cabling alternative to both networks. Ethernet, because of its higher performance and lower cost became the preferred network for PCs and Token Ring fell into obsolescence. As computer networking grew in popularity, net types of cables were developed to handle the multi-megabit data rates needed by computer networks. Fiber optics was used for the higher speed networks but at that time was much more expensive than copper cabling. A new method of using twisted pair cable, similar to phone wire but made to higher standards, was developed. Twisted pair cable was cheaper and easier to install so it be came the most popular cable type for computer networks very quickly. The change from coax to UTP required a change in architecture for Ethernet. Ethernet originally used taps on the original thick coax cable or a "T" in smaller RG-58 cable called ThinNet. UTP cable could only be used as a direct link from electronics to electronics, from the Network Interface Card (NIC) in a PC to a hub or switch that connects to the network backbone. When UTP was adopted, it required electronics to connect the links and create what is called a "star" network where PCs are connected to hubs or switches and hubs/switches are connected to the backbone. Even wireless antennas, called "access points," require cabling connections into the network. In order to convert the bus structure of Ethernet to UTP with a star architecture, an electronic repeater called a hub was used. Any signal transmitted into a hub would be repeated and sent to all equipment, either PCs or other hubs, attached to the hub. Each attached device was responsible for decoding addresses to pick up the messages being sent to it. Later, switches were adopted, since they directed messages only to the device being addressed, opening up additional bandwidth on the network. With the acceptance of structured cabling, the cable plant architecture adopted the "star" architecture used in business phone systems along with many of the specifications and nomenclature developed primarily by AT&T before divestiture. Initially, copper cabling was used for both the backbone and horizontal connections. As networks became bigger and faster, backbone traffic increased to a point that most users migrated to optical fiber for the backbone to take advantage of its higher bandwidth. Large data users like engineering and graphics used fiber directly to the desktop using a centralized fiber architecture that has been adopted as a part of cabling standards. The diagram below illustrates how computer networks are connected over structured cabling. A more recent development in LAN architecture is the passive optical LAN (POL) based on fiber to the home (FTTH) technology. The FTTH GPON (Gigabit Passive Optical Network) is like a tree and branch architecture, a variation of star architecture, using fiber optic passive splitters instead of electronic network switches. Not having electronic switches in the telecom closets, just passive components like patch panels and/or splitters, POLs offer large savings in cost of installation and operational costs. They operate only on singlemode fiber but the PON architecture uses much less fiber, fewer connections and are often installed using prefabricated cabling components. While structured cabling is primarily though of as cabling for enterprise computer networks, it is actually used from other purposes. Residential networks, security systems, industrial controls, building management systems and other systems developed for running on other cable types now offer UTP versions. Many security systems now offer versions that can operate on standard structured cabling, not just for alarms or entry systems, but even for video. Most of these systems operated on some kind of twisted pair cable anyway, so converting to the standardized category-rated UTP was simple. Although video cameras generally run on coax, they can use UTP by converting the signals using a simple passive device called a balun or to fiber using an appropriate media converter. Industrial applications of structured cabling are widespread. Most machines today are computer controlled and are connected to a network to receive programming instructions and upload manufacturing data. Industrial robots, especially, are controlled by network data and often even include plastic optical fibers inside the unit itself for control circuits because of fiber's flexibility and immunity to electrical noise. Residential networks have grown rapidly as homes are connected to faster and faster internet connections to keep up with the growing numbers of PCs in the home and demands for more data over the Internet, digital video downloads and IPTV (Internet Protocol TV.) More homes are now connected with optical fiber or DSL over copper at multimegabit speeds. Inside the home, most already have coax cables for TV, but some homes are now built with UTP cabling for digital networks. Wireless and MOCA, a network that connects PCs over the CATV coax, are also used. TIA in the US has standards covering residential (TIA 570) and industrial (TIA 1005) structured cabling. TIA 570 allows the usual UTP versions plus video (CATV or Satellite TV) on coax. Although some consumer electronics use inexpensive plastic optical fiber (POF) for TOSLINK or FireWire (IEEE 1394) links, these are not considered part of TIA 570 because they are not permanently installed cabling but only local connections between devices. Data centers are one of the fastest growing applications for computers and storage to support the growth of new applications using the Internet, like IPTV (Internet Protocol TV.) Data centers need extremely high speed connections so they generally use either Cat 6A, special coax cables or optical fiber at 10 Gb/s or above. The electronics to drive UTP cable at these speeds takes considerably more power than fiber or coax (5-10X), primarily for the sophisticated digital signal processing to reduce signal distortion on twisted pairs. A new UTP cable, Cat 8, has been developed for short (30m) links at 10G or above for server/switch connections but has not been widely supported. The standard UTP cable used to connect networks has 4 pairs of wires. The first generation of networks using UTP needed only two pairs, one transmitting in each direction, and Fast Ethernet managed to work on two pairs on the higher performance of Category 5 cable with 100 MHz bandwidth. But when Gigabit Ethernet was developed, it was necessary to use all four pairs simultaneously in both directions, as well as requiring a further development of Cat 5 specifications. 10G Ethernet went even further, requiring additional development of Cat 6 cable to 500 MHz bandwidth and even tighter specifications, to work even when using all 4 pairs. There are two other cables used also. ISO Class F and FA are sometimes called Cat 7 by manufacturers offering a US version of this shielded cable. in the US standards, there is no Cat 7 cable. It can be used in place of lower rated cables including unshielded cables. Cat 8 is a special shielded cable for use in short links in data centers, up to 30 meters, for example connecting servers and switches in the same rack. Some applications that do not require high bandwidth or crosstalk isolation can use splitters to allow two systems to share one cable. 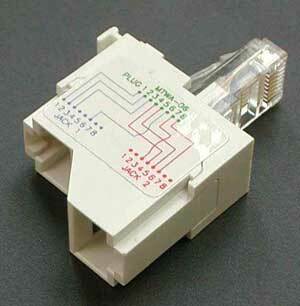 A typical application is two 10 Base-T links or an Ethernet link and a phone line. All networks have versions that operate over optical fiber as well as UTP. Fiber is generally the medium of choice for network backbones at speeds of Gb/s or higher. Most premises networks use multimode fiber but now some installations use designs similar to fiber to the home (FTTH) passive optical network (PON) systems that run over singlemode cabling. Home networks have been developed that operate over power lines and CATV coax. These options are generally used when a home is connected to broadband and cabling that supports PC networks is needed inside the home, but the owner does not want to install new cabling. The IEEE 802.3 Ethernet committee created a standard for powering network devices such as wireless access points, VoIP phones and surveillance cameras off the spare pairs in a 4-pair UTP cable. The standard was developed when it was realized that there were two unused pairs in the UTP cable at that time. Ethernet up to 100Base-TX, used only pairs 2 and 3, leaving pairs 1 and 4 available to provide power. Later versions of Ethernet used all 4 pairs and the PoE standards were revised to also use all four pairs, allowing for higher power levels. PoE uses a 48 volt power supply and requires cable of Cat 5 rating or higher. Power may be delivered using what are called midspan devices, dedicated PoE power supplies that can be plugged into links or even patch panels, as well or endspan devices, typically switches designed to provide power as well as function as an Ethernet switch. While UTP copper has dominated premises cabling, fiber optics has become increasingly popular as computer network speeds have risen to the gigabit range and above. Most large corporate or industrial networks use fiber optics for the LAN backbone cabling. Some have also adopted fiber to the desktop using a centralized fiber architecture which can be quite cost effective. Even fiber to the home architectures are being used in premises networks. Fiber offers several advantages for LAN backbones. The biggest advantage of optical fiber is the fact it can transport more information longer distances in less time than any other communications medium. In addition, it is unaffected by the interference of electromagnetic radiation which makes it possible to transmit information and data through areas with too much interference for copper wiring with less noise and less error, for example in industrial networks in factories. Fiber is smaller and lighter than copper wires which makes it easier to fit in tight spaces or conduits. A properly designed centralized fiber optic network may save costs over copper wiring when the total cost of installation, support, regeneration, etc. are included. Replacing UTP copper cables to the desktop with fiber optics was never cost effective, as each link requires converters to connect to the copper port on the PC to fiber and another on the hub/switch end unless dedicated hubs/switches with fiber ports are used. Some users did pay that cost, as they expected to upgrade to speeds that would not run on UTP and did not want to install upgrades each time the network speed increased. 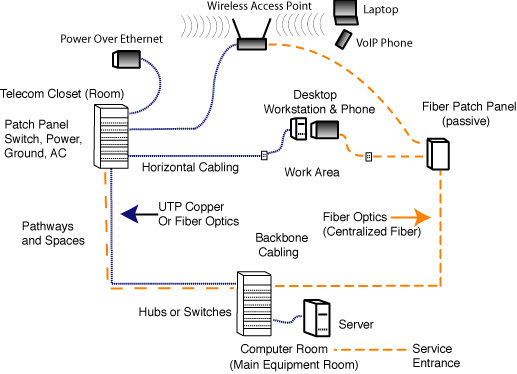 However, the solution to cost-effective fiber in the LAN is using centralized fiber (see right side of diagram above.) Since fiber supports longer links than copper, it's possible to build networks without telecom rooms for intermediate connections, just passive fiber optics from the main equipment room to the work area. In the standards, this is known as centralized fiber architecture. Since the telecom room is not necessary, the user saves the cost of the floor space for the telecom room, the cost of providing uninterrupted power and data ground to the telecom room and year-round air conditioning to remove the heat generated by high speed networking equipment. This will usually more than offset the additional cost of the fiber link and save maintenance costs. An alternative to structured cabling has developed from the fiber to the home (FTTH) passive optical network (PON) architecture. FTTH has grown rapidly to now connecting tens of millions of homes worldwide. As a result of its manufacturing volume and unique passive splitter design, the PON has become extremely inexpensive to connect users with voice, data and video over the same network. In 2009, PONs began appearing in corporate networks. Users were adopting these networks because they were cheaper, faster, lower in power consumption, easier to provision for voice, data and video, and easier to manage, since they were originally designed to connect millions of homes for telephone, Internet and TV services. Like fiber to the home, the key element in the POL is the optical splitter in the fiber distribution hub (FDH) that allows up to 32 users to share the electronics in an OLT (optical line terminal), greatly reducing the system costs. The ONT (optical network terminal) connects to the network over a single fiber and acts as a media converter, connecting phones over conventional copper cables as POTs lines or VoIP and connecting PCs and wireless access points over standard Cat 5e/6 copper patchcords. Fiber or Copper - or Wireless? LAN cabling is often perceived as the big battleground of fiber versus copper, but in reality the marketplace has changed. The network user, formerly sitting at a desktop computer screen with cables connecting their computer to the corporate network and a phone connected with another cable, is becoming a relic of the past. People now want to be mobile. Practically everybody uses a laptop, excepting engineers or graphic designers at workstations, and most of them will have a laptop as a second computer to carry, along with everybody else, to meetings where everybody brings their laptops and connects on WiFi. When was the last time you went to a meeting where you could connect with a cable? Besides laptops on WiFi, people use Blackberries and iPhones for wireless communications. Some new devices, like the iPhone, allow web browsing with connection over either the cellular network or a WiFi network. Some mobile phones are portable VoIP devices connecting over WiFi to make phone calls. While WiFi has had some growing pains and continual upgrades, at the 802.11n standard, it has become more reliable and offers what seems to be adequate bandwidth for most users. 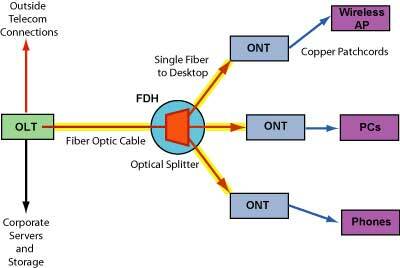 What about fiber to the desk (FTTD)? Progressive users may opt for FTTD, as a complete fiber network based on centralized fiber cabling can be a very cost effective solution, negating the requirement for telecom rooms full of switches, with data quality power and grounds, plus year-round air conditioning. Security conscious organizations use fiber because it is difficult to tap. Power users, like engineers, graphics designers and animators need can use the bandwidth available with FTTD. Others go for a fiber backbone or zone system, with fiber to local small-scale switches, close enough to users for those who want cable connectivity instead of wireless, to plug in with a short patchcord. More recently, applications with many users like large companies or organizations, educational institutions, hotels, hospitals, etc. have found passive optical LANs based on fiber to the home technology to be the most capable and cost effective networks. It’s the job of the designer to understand not only the technology of communications cabling, but also the technology of communications, and to keep abreast of the latest developments in not only the technology but the applications of both.